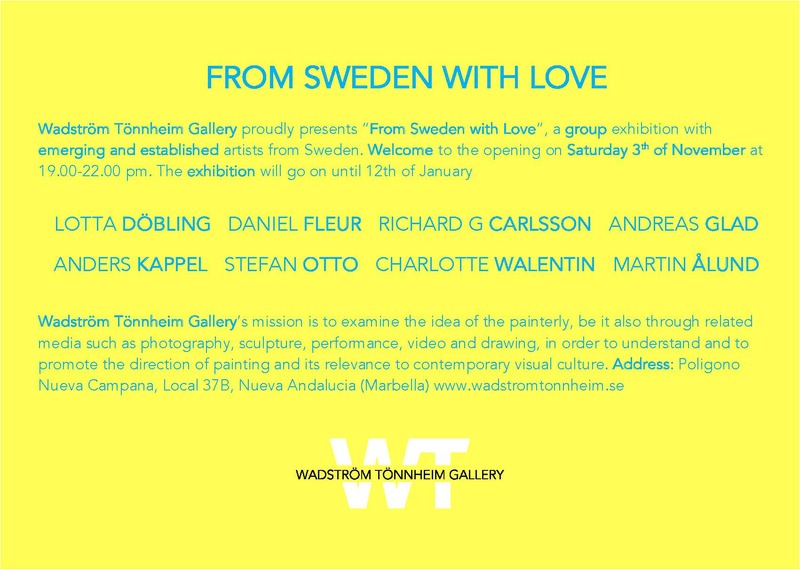 Wadström Tönnheim Gallery proudly presents “From Sweden with Love”, a group exhibition with emerging and established artists from Sweden. Welcome to the opening on Saturday 3th of November at 19.00-22.00 pm. The exhibition will go on until 12th of January. – This is an excellent opportunity for everyone in Marbella and Andalusia that as an interest in contemporary art to discover impressive Swedish art. And as a Swede with a relatively newly established gallery in Marbella I’m really pleased to present this eminent group exhibition with skillful Swedish artists, which of many the gallery have worked with for several years. Says Mattias Tönnheim, owner and director of Wadström Tönnheim Gallery. Address and opening hours: Poligono Nueva Campana, Local 37B, Nueva Andalucia (Marbella). Open Wednesdays to Saturdays 14.00-18.30, or by appointment.